There are a number of factors to consider when seeking compliance with chemical storage regulations. Most of these factors can be addressed by taking certain actions and refining your chemical storage practices. Taking steps to prevent hazmat situations is the best way to work towards compliance. 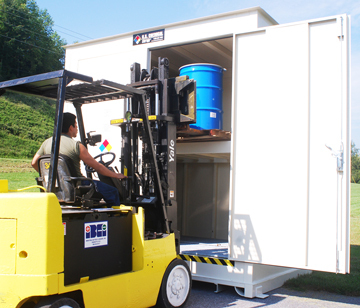 Designing your storage facility requires an acute understanding of chemical storage regulations. Certain substances require specific environments to maintain the safety of your personnel. A fully customizable storage building gives you full control over your chemical storage environment, so your chemical inventory is maintained and your facility is protected. Your chemical building should be equipped with accessories that mitigate hazards. Some of these are fairly obvious – fire suppression systems for flammables storage, ventilation for fuming materials, and personal safety equipment such as eyewash and shower stations. You should also have a containment sump designed to prevent leaks and spills from escaping your chemical storage area. Along with designing a safe and compliant storage building, your chemical storage practices are an important part of remaining compliant with chemical storage regulations. There are a number of ways to ensure the protection of your personnel, one of which is implementing procedures designed to mitigate chemical hazards. Attain all required permits for your chemical storage. Store dry materials above liquid to reduce the risk of contamination. Segregate incompatible materials to reduce the risk of dangerous chemical reactions. Keep chemicals in their original containers, dated. Display proper signage to alert personnel of potential hazards. Keep edibles away from the chemical storage area. Take steps to ensure your electrical and fire suppression systems are in proper working order. Report any qualified hazardous materials to authorities so emergency services are aware of hazards. Chemical storage regulations may vary according to location, but federal regulations are in place by OSHA and EPA to prevent and protect against chemical hazards and heeding them is the best way to safeguard your personnel, community, and environment. Always consult federal, state, and local authorities for full coverage of chemical storage regulations.